Here you can read articles, which are also available in JPG format. 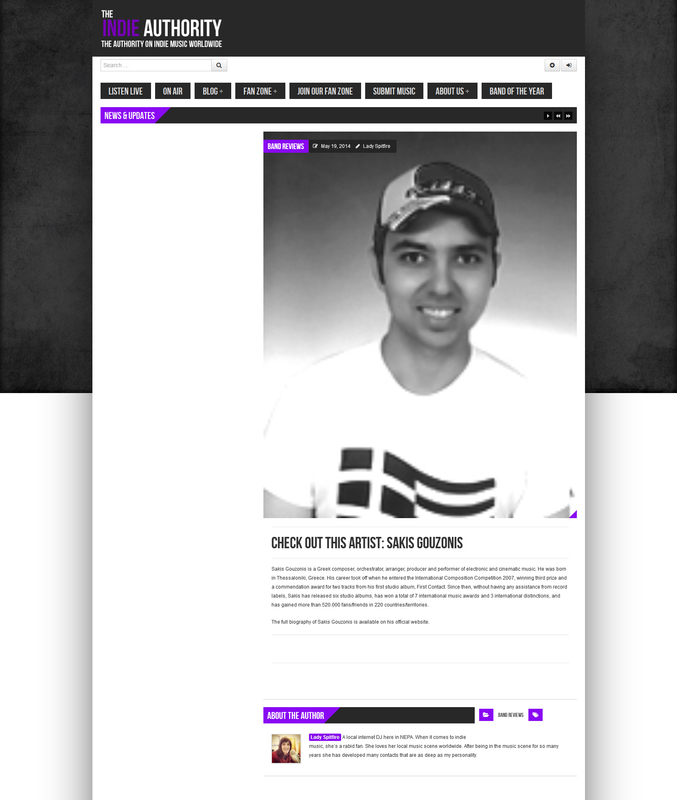 For any questions or requests you may have, contact Sakis Gouzonis. If you are a Sakis Gouzonis fan there is a chance you have already heard the great news about the new Sakis Gouzonis album due for release this spring on May 16, 2016. Sakis Gouzonis is clearly one of the most unique success stories stemming from Greece. Since 2008, Sakis Gouzonis has captivated audiences in and outside Greece. He is a very creative composer and the recipient of many international music awards. Sakis Gouzonis’s outstanding music has grown in excellence year after year, and his many recordings have been recommended by Blazing Minds, AltSounds, Broadway World, Top40-Charts, CountryHome, Eyeplug, My Play Tag, MusikFace and numerous other media outlets around the world. Today, Sakis Gouzonis’s international fan club consists of more than 640,000 members in 220 countries. What makes this all the more impressive is that it has all been done independently, with no record labels or music management companies involved in supporting him. 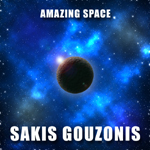 The new Sakis Gouzonis album will be available on his website at https://www.sakisgouzonis.com. “A World At Peace” features ten new instrumental electronic tracks. 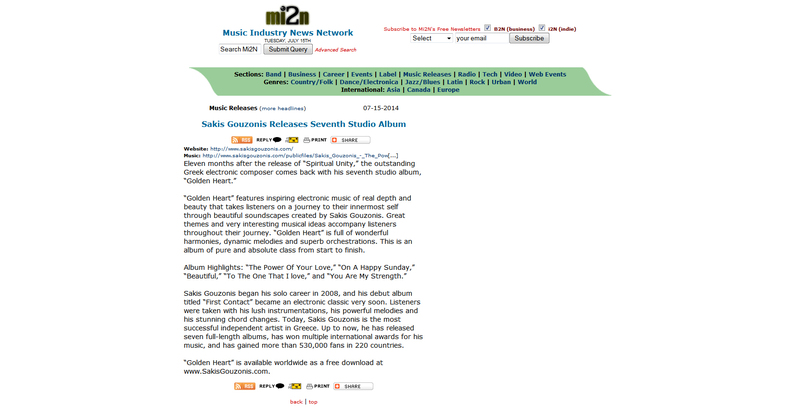 It is a masterfully crafted album, which showcases Gouzonis’s unique talent not only as a composer but also as a producer. The compositions are superb, the arrangements excellent and the performances tremendous. The Greek composer knows exactly how to take his listeners on a journey full of positive and strong emotions. Sakis Gouzonis, also known as Sakis, comes from the land of Greece. He is a prolific independent composer, orchestrator and producer, and for some people he is the definition of quality instrumental electronic music. Until now, Sakis has released eight instrumental albums, has won a total of ten international music awards and distinctions, and has gained more than half a million fans in 220 countries. 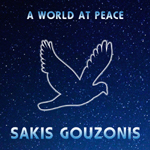 “A World At Peace” is available as a free download at www.sakisgouzonis.com. 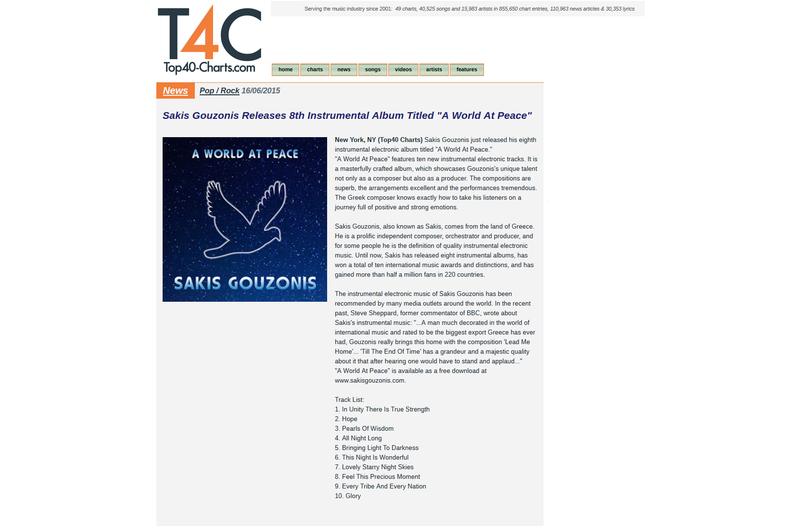 Greek electronic composer Sakis Gouzonis is back with his 8th instrumental album titled “A World At Peace,” which has been achieving significant penetration across the globe via the internet. It is more than obvious that there is already a fast-growing fan base out there totally in love with this composer nowadays. Whether you are a new or an old electronic music fan, you will most probably love Sakis Gouzonis. As a newcomer, building familiarity within this style, one walks away feeling like they listened to something a little truer than accustomed. There are ten electronic instrumental tracks on the new album that display the artistic genius of a composer that has always had a spark of creativity fizzing distinctly to his very surface. From the powerful single ‘In Unity There Is True Strength’ to the epic track ‘Glory’, Sakis Gouzonis shows us what real music sounds like. 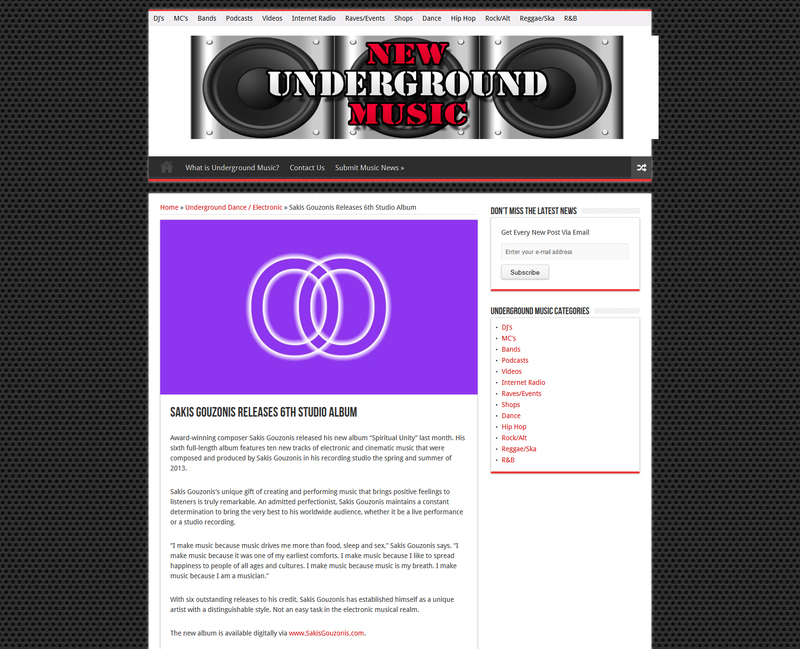 Visit today the official website of Sakis Gouzonis at www.sakisgouzonis.com to stream and download the new electronic instrumental album for free. Greek electronic composer Sakis Gouzonis is back with his seventh studio album titled Golden Heart. The new album was produced by Sakis himself in his recording studio located at the foot of Mount Olympus. Golden Heart, an amazing hybrid of electronic, pop and cinematic music, showcases the composer’s considerable strengths: buoyant, unforgettable melodies, sleek, stylish orchestrations, and energetic, dynamic performances. “The Power Of Your Love” is a stunning epic track with a brilliant bass line and lead melody, which could be the main theme of a Hollywood epic movie. Other highlights include the deeply groovy “On A Happy Sunday,” the propulsive “Beautiful,” and “You Are My Strength,” which will thrill long-time Sakis Gouzonis fans with its awesome beat and high-stepping melody. Sakis Gouzonis, also known as Sakis, was born in Thessaloniki, Greece. His musical career took off when he entered the international Composition Competition 2007, winning third prize and a commendation award for two tracks from his debut album First Contact. To this day, Sakis has released seven full-length albums, has won a total of ten international music awards and distinctions, and has gained more than half a million fans in 220 countries. What makes this all the more impressive is that it has all been done independently, with no record labels involved in supporting him. Since 2008, he has captivated audiences in Greece and Europe. 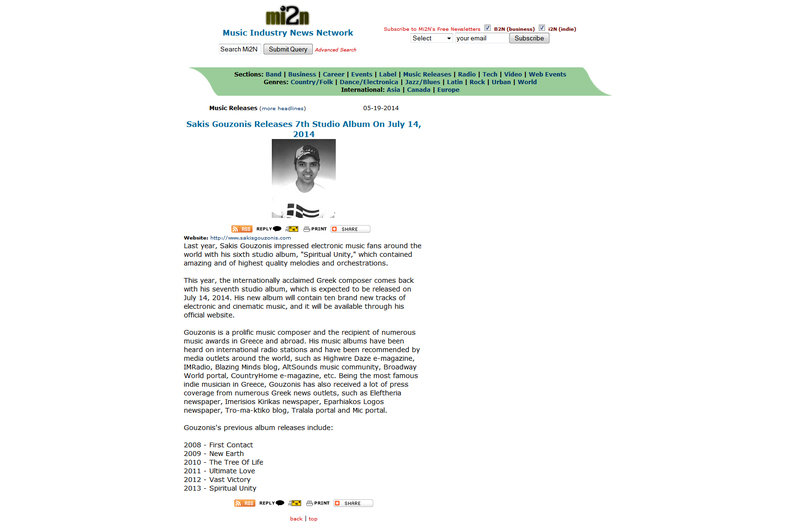 His music has been heard on radio and television and his many recordings have been recommended by Highwire Daze, IMRadio, Blazing Minds, Cross Rhythms, AltSounds, Broadway World, CountryHome, Eyeplug, UK Top 40 Charts, The Journal of Humanitarian Affairs and many other media outlets around the world. Being the most successful independent artist in Greece, Sakis has also been featured on some of the biggest Greek media outlets, such as Imerisios Kirikas, Eleftheria, Mic, Tro-ma-ktiko, Tralala, Larissa Net and Zougla. 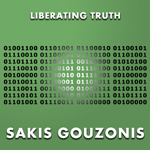 Sakis Gouzonis’s new album, which has been designed to provide a rich listening experience, contains 10 tracks of magnificent electronic music, and it is available for free at https://www.sakisgouzonis.com. Be sure to check it out. The Greek composer just released his 7th studio album titled “Golden Heart.” The new full-length album features 10 electronic and cinematic tracks that evoke a multitude of emotions. All tracks were produced by Sakis in his recording studio located at the foot of Mount Olympus. Sakis’s music is entirely instrumental, and “Golden Heart” is an atmospheric soundscape with extensive use of plentiful sweeping strings throughout the album and an amazing variety of beats, which lead the listener through the album. In particular, the new album consists of many anthemic tracks that lift the spirit, such as “The Power Of Your Love” with its superb melody; “Higher And Further” with its driving beat; “On A Happy Sunday” with its joyful chorus; “Beautiful” with its amazing intro, and “Love In Action” that could be the perfect song for the end of a romantic movie, leading into the credits. Visit www.SakisGouzonis.com to listen to and download “Golden Heart” for free. “Golden Heart” features inspiring electronic music of real depth and beauty that takes listeners on a journey to their innermost self through beautiful soundscapes created by Sakis Gouzonis. Great themes and very interesting musical ideas accompany listeners throughout their journey. “Golden Heart” is full of wonderful harmonies, dynamic melodies and superb orchestrations. This is an album of pure and absolute class from start to finish. Sakis Gouzonis began his solo career in 2008, and his debut album titled “First Contact” became an electronic classic very soon. Listeners were taken with his lush instrumentations, his powerful melodies and his stunning chord changes. Today, Sakis Gouzonis is the most successful independent artist in Greece. Up to now, he has released seven full-length albums, has won multiple international awards for his music, and has gained more than 530,000 fans in 220 countries. 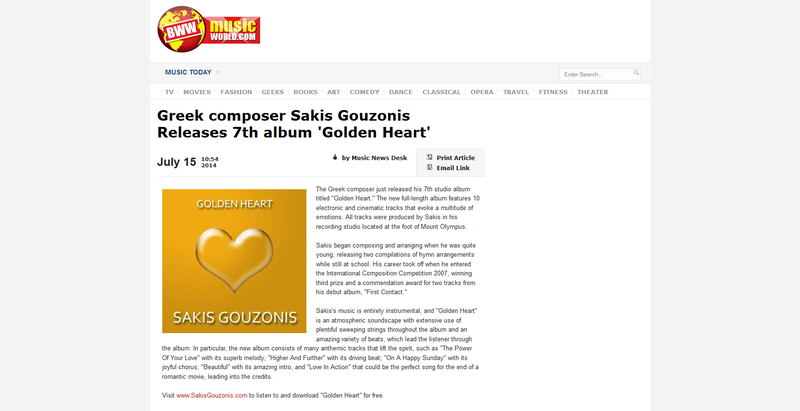 “Golden Heart” is available worldwide as a free download at www.SakisGouzonis.com. Sakis Gouzonis is a Greek composer, orchestrator, arranger, producer and performer of electronic and cinematic music. He was born in Thessaloniki, Greece. His career took off when he entered the international Composition Competition 2007, winning third prize and a commendation award for two tracks from his first studio album, First Contact. Since then, without having any assistance from record labels, Sakis has released six studio albums, has won a total of 7 international music awards and 3 international distinctions, and has gained more than 520.000 fans/friends in 220 countries/territories. 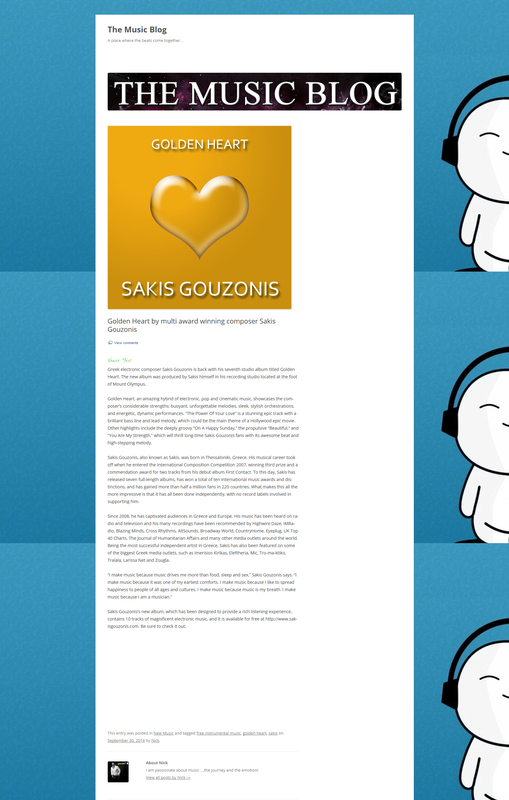 The full biography of Sakis Gouzonis is available on his official website. Last year, Sakis Gouzonis impressed electronic music fans around the world with his sixth studio album, “Spiritual Unity,” which contained amazing and of highest quality melodies and orchestrations. This year, the internationally acclaimed Greek composer comes back with his seventh studio album, which is expected to be released on July 14, 2014. His new album will contain ten brand new tracks of electronic and cinematic music, and it will be available through his official website. Gouzonis is a prolific music composer and the recipient of numerous music awards in Greece and abroad. His music albums have been heard on international radio stations and have been recommended by media outlets around the world, such as Highwire Daze e-magazine, IMRadio, Blazing Minds blog, AltSounds music community, Broadway World portal, CountryHome e-magazine, etc. 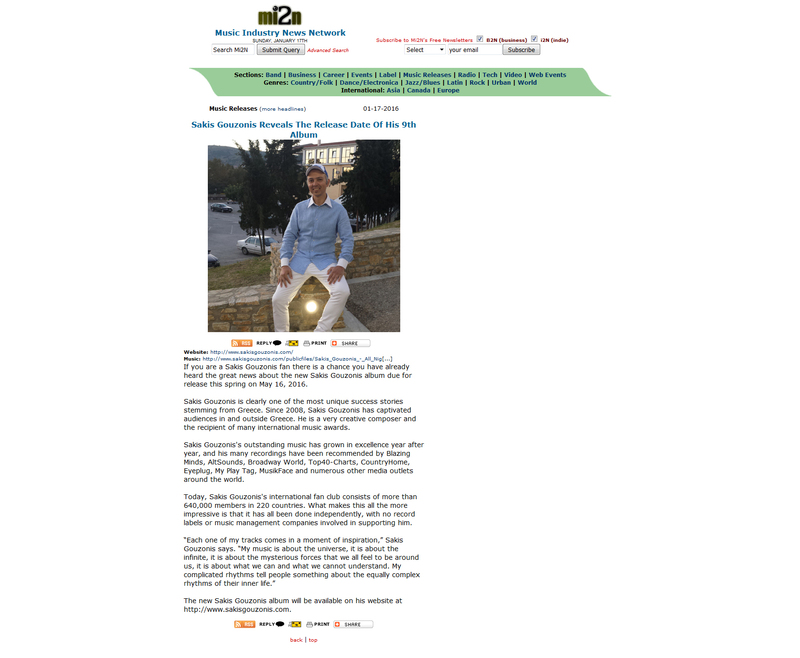 Being the most famous indie musician in Greece, Gouzonis has also received a lot of press coverage from numerous Greek news outlets, such as Eleftheria newspaper, Imerisios Kirikas newspaper, Eparhiakos Logos newspaper, Tro-ma-ktiko blog, Tralala portal and Mic portal. 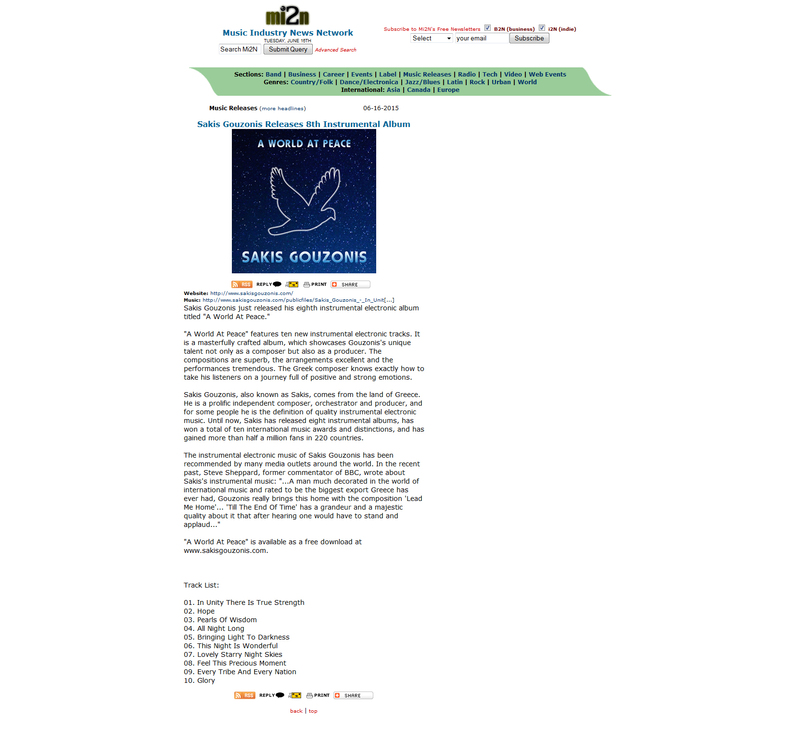 Award-winning composer Sakis Gouzonis released his new album “Spiritual Unity” last month. His sixth full-length album features ten new tracks of electronic and cinematic music that were composed and produced by Sakis Gouzonis in his recording studio the spring and summer of 2013. Sakis Gouzonis’s unique gift of creating and performing music that brings positive feelings to listeners is truly remarkable. An admitted perfectionist, Sakis Gouzonis maintains a constant determination to bring the very best to his worldwide audience, whether it be a live performance or a studio recording. With six outstanding releases to his credit, Sakis Gouzonis has established himself as a unique artist with a distinguishable style. Not an easy task in the electronic musical realm. The new album is available digitally via www.SakisGouzonis.com. All articles are available both in plain text and in JPG format. For any questions or requests you may have, feel free to contact Sakis Gouzonis anytime you want.